Plans for unified heavyweight champion Anthony Joshua 22-0 (21) to make his USA debut have been leaked online by a delivery person who recorded his phone conversation with the WBA, IBF and WBO titleholder. In the call with the unnamed delivery firm Joshua revealed his April 13 date at Wembley Stadium is as good as dead in the water. AJ continued: “The only thing I can think is if they’re trying to make me stop training and then two weeks out they’ll say ‘yeah, we wanna fight’ and I’m two weeks out of preparation. They might try and catch me dry. 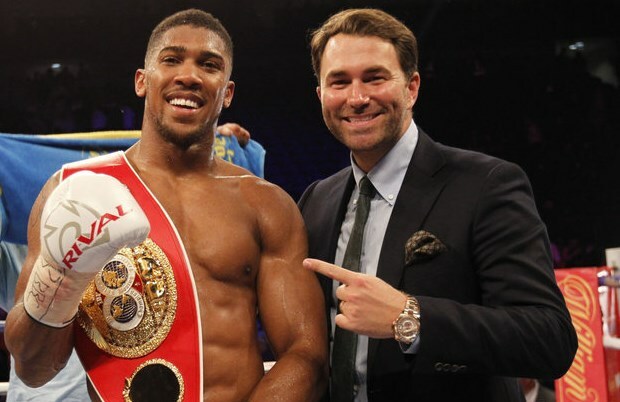 Eddie Hearn, who has promoted Joshua throughout his professional career, tried to put a positive spin on the situation, saying that the leaked call might actually help boost the heavyweight’s profile. The call was leaked the same day as news broke online that Joshua and Jarrell ‘Big Baby’ Miller 23-0-1 (20) fight is a done deal. But the undefeated American behemoth denied the fight had been signed just yet. “It’s not official yet, we’ve got a couple of more things we’re working on,” Miller told BoxingTalk. Miller said the talks have been positive and that he expects the deal to get done. “I do, but you know me, my energy isn’t really there until I know it’s done and official. Hopefully it gets all done next week,” he said.